South of the Border Braised Awesomeness – Damn Life is Good! Is this a fajita? A taco? Is it even considered Mexican food? Who knows? What we do know is that this is fun, easy and freakin’ delicious. It’s a low and slow meal with a quick prep time and a long cooking time (about two hours) – perfect for a lazy Sunday afternoon. The amounts below will make about four-five “tacos” – perfect for two. Adjust your recipe accordingly. In the morning you are making this dish (or even the night before), get your rib-eye out, pat it dry and season with salt and pepper (generous on the salt) and put it on a plate and stick it, uncovered, back in the fridge. Let it hang out and “dry age” for 2-12 hours. For the prep, we’ll start by making a tasty crema that will provide cool and acidic notes. First, pull out one or two of the chipotle peppers in adobo – roughly chop them up. In a bowl, combine sour cream, lime zest, lime juice, 1/2 the cilantro (about 1/4 C) and the chopped chipotles. Mix up and taste – amazing, right? Pull your rib-eye from the fridge and let it warm up a bit. In an oven-safe pan with a lid (dutch oven, cast iron pan – your pick), heat the olive oil until shimmering. Brown all sides and edges of your rib-eye to get a nice sear. Turn down the head and add the stock, wine and bay leaf (you might also want to toss in a sprig of thyme and a few roughly chopped bits of onion, carrot and celery, if it’s handy – the classic mirepoix). You don’t want the liquid to cover the rib-eye, but maybe come up half way. Get the goodies simmering and then put on the cover and slide into the oven. Set the timer for one hour. While that cooks, prep the radishes and jalapenos and maybe pour yourself a nice glass of wine. At the hour mark, check the meat. It won’t be quite ready yet, but you’ll want to make sure there is still enough liquid in there (you don’t want it to go dry!). If not, toss in a little more stock and wine. Check again in 30 minutes. If done, pull out, but if not, braise for another 30 minutes. When the steak is done, put into a bowl and shred roughly with two forks – it should almost fall apart. Mix in a bit of the braising liquid to keep it moist and season with salt and pepper if needed. In a dry, clean frying pan on the range, heat up the corn tortillas for a few seconds (we do two at a time). Pro tip: if you have a gas range, you can heat the tortillas right over the flame and get a little char on them. 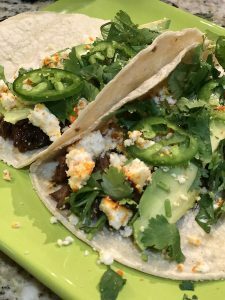 Fill the tortillas with the braised beef, some crumbled cheese and a generous scoop of crema. Add a few avocado slices. Top with jalapeno and radish and finish with a few pinches of fresh cilantro. Take a bite and just smile. You’re welcome! Pro tip: the queso fresco will spoil quickly in the fridge. We only use about a quarter at a time (yields about 1/2 C of crumbles), so we toss the other quarters in a baggie and freeze – it’s one of those rare cheeses that freezes very well.